Run Time: 99 Min Rated G (Canada) Rated PG (MPAA) thematic material including some medical situations. Hot on the heels of Captain America: The Winter Soldier the number-one movie for the third week in a row, pulling into the number two spot at the box office this Easter weekend was the Christian-themed film Heaven is For Real based on the popular book by the same name. The film, like the book, tells the story of young Colton Burpo (Connor Corum) and his family following the boy’s revelation that he'd been to heaven while having an emergency appendectomy surgery. The family was already going through a tough time both financially and physically. 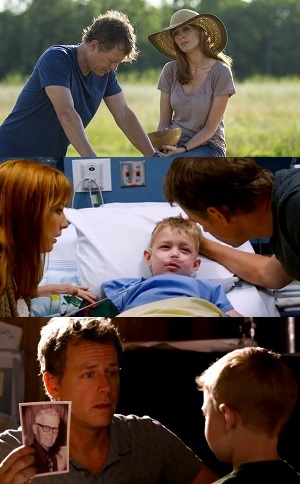 Colton's father, Pastor Todd Burpo (Greg Kinnear), had suffered from kidney stones, a badly broken leg, and had undergone a mastectomy. Feeling a bit like Job the prospect of losing his son pressed the pastor to the edge of doubt—a rough place to be for a father and pastor. The film details the struggles that came along with Colton's testimony concerning heaven. Readers who enjoyed the book will likely enjoy the movie. It stays fairly close to what is found in the pages of the book and keeps to its general premise with one exception. Both the book and the film are presented as non-fiction and this is challenging for the film makers because there will be Christians and non-Christians who will be sceptical of the story itself. What are the film makers to do? Do they make a movie that tries to convince the sceptical mind or do they make a film that "preaches to the choir?" In the end they seem to attempt both and this is a weakness of the film because even with Oscar-nominated actors like Greg Kinnear and Thomas Haden Church directed by Oscar-nominated Randall Wallace there likely isn't enough polish and credibility to cross this story into the mainstream. Mainstream crossover appeal is necessary for generating water cooler discussions of the question at hand: "Is heaven for real or not?" The film would have been stronger if it had narrowed its sights on a more targeted audience and then stayed true to that audience. Overall the movie has touching moments as it depicts the Christian family in a congenial way, even throwing some matrimonial romance into the mix. Dealing with financial issues, medical bills, and serious illnesses is compelling as many people have to deal with those real-life circumstances. Also compelling on its own is the Burpo family's need to be “grounded” in their times of trouble, just like other families. In the end, the Burpo family find their grounding in their Christian faith through the lens of young Colton's experience. The hard sell is Colton's experience. It's extraordinarily unusual and, for most people, extraordinary claims require extraordinary evidence. Remember last year's film The Conjuringabout a young family’s experience with ghosts? It too was presented as a true story based on a book and claimed to provide knowledge of life after death—a topic interesting to many people which can be approached in many ways. In Burpo’s book there is a moment when father and son are together driving along a road surrounded by Nebraska cornfields. Pastor Burpo notices St. Paul's Lutheran Church, built in 1918, and asks himself, "I wonder what the people of this longstanding local fixture would think of the things our little boy had been telling us?" The scene isn't in the film, but the question’s fingerprints are all over the movie. And it's a good question because Lutherans, along with other Christians, will ask "Is this story a true story?" Or at least, how much of this story is true? Many Lutherans will evaluate the truth claims of the film using the yard stick of Holy Scripture. Where the film and/or book are in line with Scripture then the claims will be deemed acceptable; where they take a step away from Scripture, Lutherans and many other Christians will be suitably suspicious. For Christians the final authority on heaven ultimately is the revealed Word of God which supersedes all other claims. The heart of this Word of God, the gospel—the good news of the Bible—is Jesus, and if the film gets Jesus wrong then it will struggle to get the rest right. St. Paul has strong words for those who would misrepresent the gospel. In Galatians he says, "even if we or an angel from heaven should preach to you a gospel contrary to the one we preached to you, let him be accursed." This is theological dynamite and it draws a fine point on the seriousness of the claims. Not long ago there was a film by comedian Ricky Gervais, The Invention of Lying (2009), that had at its heart an assertion that heaven is not for real but is in fact a big lie—maybe the biggest ever. Viewers of Heaven is For Real will have to consider whether Colton's story is true and ultimately whether heaven is true. Where the book is more compelling than the film is in its frequent insistence that a person needs to have Jesus in order to get to heaven. Is Jesus in Heaven is For Real? Yes. But there are missed opportunities in the film to make it as clear as it is in the book that Jesus is necessary for entry through those “pearly gates.” Why is this important? Well, if a viewer watches the film and walks out of the theatre saying,“I believe heaven is for real! That kid's story convinced me of it; he just had to be telling the truth; how on earth could he have known those things if he wasn't!” they may also be left with a new problem: “Heaven is for real, but now what? How do I get there?” The film doesn't definitively answer this especially at a couple of key moments. There is an important axiom to consider when thinking about this film and it goes like this: “The Gospel assumed is the Gospel denied!” In the Gospel of John Jesus Christ says, “I am the way, and the truth, and the life. No one comes to the Father except through Me." The film isn't as clear as Jesus. If viewers hope to see a visual representation of heaven they may be underwhelmed by the way the film portrays Jesus, the angels and heaven. If viewers are looking for a strong, clear proclamation of the Gospel they too may be underwhelmed by the film’s presentation of Pastor Burpo's faith and preaching. If viewers are looking to be convinced heaven is for real they may need to ask if they are the kind of person who demands hard evidence or wise philosophy. If they need those things, this film doesn't really provide them. If signs and human wisdom aren't the be-all and end-all, such a person who seeks to know if heaven is for real would be better served by going to a place where Christ crucified is preached, where the Jesus of Scripture is clearly proclaimed. If on the other hand a viewer is seeking a heartwarming, G-rated film with above average acting, solid production values and a happy ending then Heaven is For Real will be satisfying. After watching a movie like Heaven is For Real Christians need to ask, "Where does my assurance come from? What do I believe is the standard for truth? What makes a true story true?" Apart from those questions the non-Christian will simply ask, “Is this a good movie?” The answer to the last question is, it's an ok movie, maybe a bit above average; better than a made-for-TV Hallmark Hall of Fame film but it's not going to receive any Oscar buzz come awards season. Heaven is For Real, Todd Burpo with Lynn Vincent, Thomas Nelson, 2010, pg 87.